What maths is being used to calculate this interest? I'm curious about how my bank is calculating the interest on my credit card. No matter what I do, I cannot make the numbers add up! Below is a photo of my latest statement. It's for 13th June - 12th July. 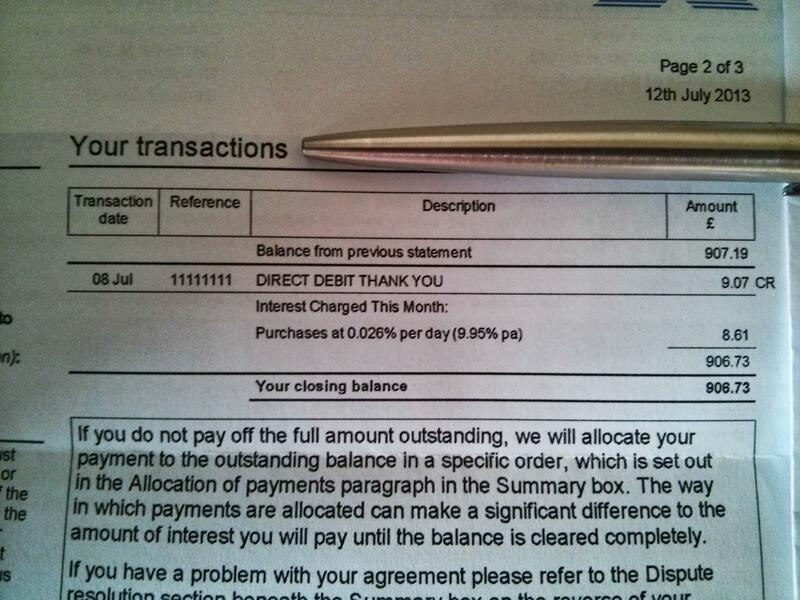 There were no purchases, but an opening balance of £907.19, and a payment of £9.07 on 8th July. The statement says that interest for my entire balance (all purchases) is "0.026% per day (9.95% APR)". The statement clearly says on the back that interest is calculated daily. So, I took the opening balance and added 0.026% per day, then subtracted £9.07 on 8th July, then continued adding 0.026% per day, until 12th July. I ended up with a closing balance of £904.98 (theirs is £906.73). I've subsequently tried all sorts of different calculations, and cannot come to their figure without increasing the rate quite a bit. Even if I round up every days value to the nearest penny, I only get £905.32. So; how are they calculating this? Or is their maths wrong and I'm being charged higher than the rate being claimed? Spoke to someone at my banks credit card department today. She didn't really seem to understand the maths. When I told her I'd multiplied by 1.00026^30 she asked where there was a 1! However, this good information (well, confirmation of what I had) was somewhat undermined when she said "Some interest will be calculated from the opening balance (£907.19) and some from the closing balance (£906.73). This doesn't really make sense (how can you calculate interest using a figure that is derived from the interest?!). So said she'd have to pass the info on to their "back office" who can send me a full breakdown. Ok; this didn't really turn out to be a maths question; but rather just an overly-simplified bill. I had a letter from my bank explaining how it worked (which was quite confusing, but I managed to get my head around it!). With my bank, if you pay off your credit card balance before the end of the month; no interest is charged on that months purchases. However; the interest is still calculated for the period between the purchase and the end of the month, and it is deferred to the following month. So if you make a purchase on 1st month and pay it off on 30th (assuming billing cycle is each month, which it's not in my case, but makes it easier ;-)), then you will pay no interest. However, if you do not pay it off, then the following month you will pay two months interest for the purchases (the deferred interest from the first month, which wasn't added on previously, in case you paid it off the same month, and also the interest from the second month, which can be added on immediately, since there's no way you can "avoid" this interest because the purchase was made in a different month). So, in short; you will see "double" the interest for purchases on a month after making purchases, making up for the first months interest not being on the first bill, due to the "pay it off same month, don't pay the interest" rule. Helpfully, they included the previous few months breakdown, so I could see the amount of interest calculated for May purchases, then charged in June, then June purchases, which was included in July. I checked my May statement, and say there was no interest charged, despite purchases that month. An interesting think that I misunderstood, is how they calculate interest. Their "daily rate" is not compounded; they instead add up all of the balances for each day, and then simply multiply by the daily rate. I think this is slightly confusing. By "charging interest daily", I presumed they meant it was being compounded each day; however I believe what they actually mean is that your balance for each day is taken into account, so if for 3 days in the middle of the month your balance was really high; it will be taken into account, rather than interest just being based on a single value that is your closing balance. What technique is used for this simplification? What properties were used to make this valid?